Our Beagle Minnie does one hell of a job creeping up on you and I've come to expect her stealth way of getting her point across. I walk down our hallway on the way to the bedroom to change clothes. Minnie is nestled all snug and comfortable in her doggy bed rolling her big sad eyes up at me as she sees me approach and bang a right into the bedroom. I open the closet doors and turn around. Bam! There she is lying like a flat pancake smack in the middle of the entrance to our bedroom. She's flopped herself down 50% perfectly inside the bedroom and 50% outside the hallway. She's trying to tell me something. I know what she wants. She wants to be taken for a walk around the neighborhood which we affectionately call 'the round'. I turn my back on her to grab something out of my closet and no sooner do I turn around to find her flopping on the floor about a 1/3 closer to me. She's trying to get my attention. I imagine she believes she is being subtle and I won't notice that just a fraction of a second ago she was 75% away from me in the hallway/bedroom area. I know what she's up to, but I've decided to make her work for her walk. I don't make eye contact with her. I pull out a top and begin to change knowing that at any moment she will have decided upon two actions: (1) move just a little bit closer to really bring home her point or (2) jump up on my thigh to do her magnificent long arching back stretch which clearly indicates she's worn me down and will be taken on a walk. Most of the time I don't mind her creeping up on me. It's kind of cute most days. Spencer and I hardly ever stumble over her or step on her tail when she moves unexpectedly closer to one of us to get our attention. She does one hell of a job getting her point across that she needs something and isn't afraid to put herself in the way of an occasional misstep. She's just a dog who knows what she really, really wants. Today is really no different except this time I had every intention of taking her for a walk. It's nearly 1:30pm and I'm on vacation today. I'm still walking around in my nightgown with a full belly of coffee and a loose plan on how I'm going to plan the rest of my free time. Thanks to Minnie's steady creeping up on me, I know the first thing I have to do is take her on the walk. She's worked marginally to get my attention this time and in a way I'm bummed out that she decided to pass on the thigh jump and stretch routine. Today she's opted to position herself into a nest of warm pillows on my side of the bed and stare at me as I write this blog as if to say, "C'mon. You can write about me all you want later today, but take care of me first." Who am I not to oblige? DSC_0045, originally uploaded by iamchief. I was right. All those little pieces popped up if you ran out of time. DSC_0047, originally uploaded by iamchief. I haven't seen this game for years. I had forgotten what it looked like. 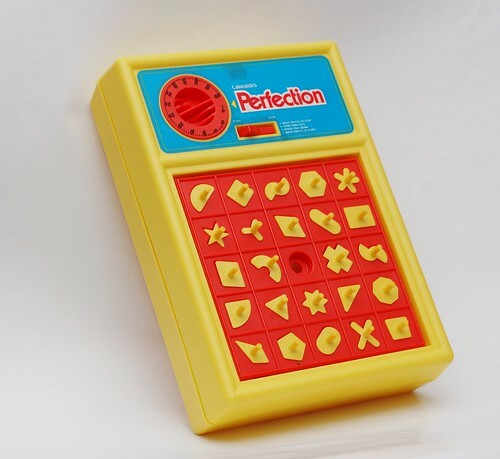 All I remember was that stupid timer ticking and then if you didn't get all the shapes put in place, the buzzer would ring (I think) and all the little different shaped pieces would pop out. 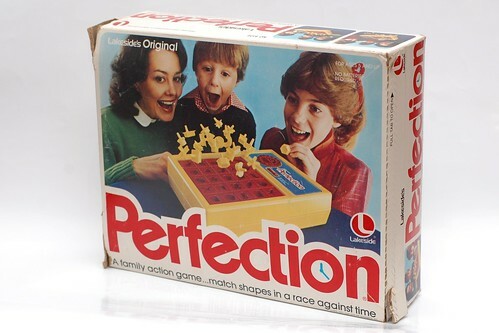 This game freaked me out. They should have called it Pressure. This is the closest thing to child abuse that my parents bought me for Christmas.